Urine can become discolored due to certain foods, food dyes and supplements you consume. Berries, including cranberries, can stain your urine. Your level of hydration and what else you ate with the cranberries will vary the color of your urine. When cranberries or other foods stain your urine, it's usually only temporary and is nothing to be alarmed about. The typical color of urine is straw-yellow. When you eat certain foods such as berries, beets and other naturally red foods, it can stain your urine a different color. The color can range depending upon your diet on that particular day and how many cranberries you consumed. 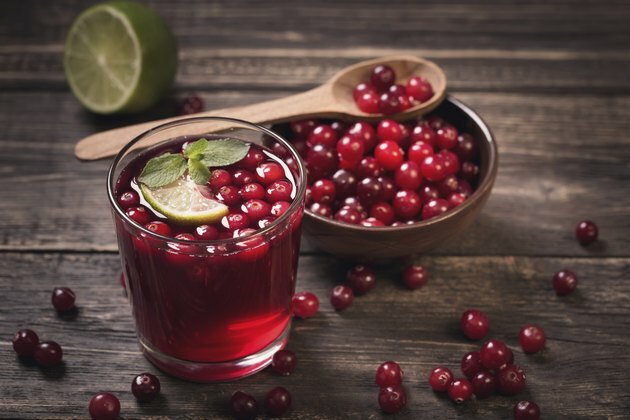 The color of your urine may appear light pink, especially if you only had a few cranberries and were very hydrated or dark pink if you ate a lot of cranberries and were not very hydrated. The natural pigment found in cranberries, as well as other berries, is what stains your urine a different color. The American Dietetic Association explains that the crimson color of cranberries is caused by a flavonoid that helps lower your cholesterol and reduces the risk of stroke and heart disease. Cranberries, as well as the juice from cranberries, can also stain your fingers, hands and clothes if the juice penetrates the skin or your clothing material for a long period of time. Your teeth and mouth may even become temporarily stained from eating cranberries as the juices are released into your mouth. Your urine can appear pink or red if you've eaten other foods such as rhubarb, blackberries or beets. Certain medications such as some laxatives, antipsychotics and other medications can cause your urine to appear red or pink. Chronic lead poisoning and mercury poisoning can release toxins into your urine, which can alter the natural hue of your urine. Another possibility is blood in your urine. Blood may be present in your urine if you have a bladder or urinary tract infection, kidney stones, bladder stones, an enlarged prostate or cancer of the kidneys or bladder. Since discoloration of urine is usually temporary, it should only last a few hours to maybe a day or so. If you have discolored or stained urine for a prolonged period of time after you've stopped eating cranberries, talk to your doctor. Tell him of any supplements that you've taken and what other types of foods you've eaten. When using the restroom, watch for warning signs such as painful urination, abdominal cramping, fever, chills and lower pressure in your abdomen. These are all signs of a possible infection.